The general secretary of Labour’s biggest single donor, got a standing ovation from party conference delegates in Liverpool for his speech demanding unity from MPs to make Jeremy Corbyn Prime Minister. He said the party was weathering “the smears and the sneers from the media – and some who should know better”. Voters were desperate for an end to Tory government and backed Labour’s agenda, he said. “Wouldn’t it be great, comrades, if all our party, from top to bottom, was united in promoting our alternative? “I’m not talking about an unthinking agreement on everything or blind loyalty. “Anyone has a right to disagree and a right to criticise. “But I am talking about some MPs turning into an echo chamber for whatever line of attack the Tories and the press are deploying against us,” he complained, to cheers and applause from delegates. That was seen as targeted at Labour MP Dame Margaret Hodge, who in July angrily told Mr Corbyn he was an “anti-Semite and a racist” as he resisted adopting an international definition of anti-Semitism. 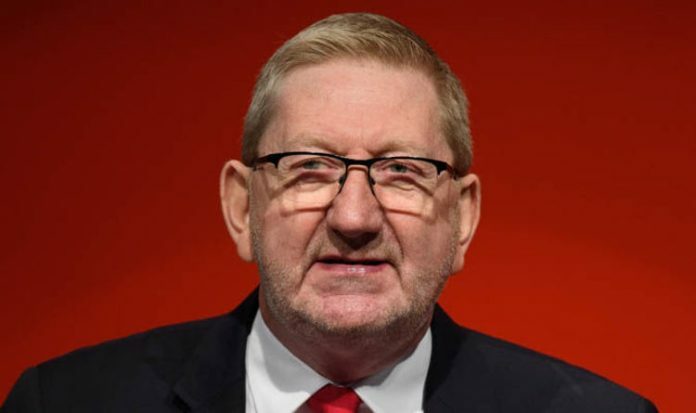 Mr McCluskey went on: “It’s time for all of us, each and every one of us, to speak up for our leader – the most decent and principled man in politics today. He also warned against heeding “siren voices” in the party backing a breakaway movement. Referring to the Daily Express’s revelation last month about anti-Corbyn MPs including Chuka Umunna holding secret meetings at a luxury bed and breakfast in Sussex to discuss Labour’s future, he declared: “If the centre ground is fighting for a better deal for working people and protecting our communities, look no further. “It’s right here in the Labour Party. “So Chuka, drop the country club plotting. Listen to working people the length and breadth of the country. Mr Umunna Tweeted in response: “I’ve said it before and I’ll say it again: I stand by what I’ve said on bullying and racism in the Labour Party and won’t be bullied into silence by anyone,not least because my family have experienced racism too. Dame Margaret also hit back, Tweeting: “It isn’t immoral or indecent to point out that too little has been done to eradicate Anti-Semitism in the Labour Party. Footage later emerged of Mr McCluskey in a confrontation with a Jewish campaigner as he arrived to speak at a pro-Palestinian fringe meeting in Liverpool on Sunday night. Jewish Human Rights Watch activists asked why he had dismissed Labour’s anti-Semitism scandal as “mood music”. He said he now realised the phrase was “taken as offensive” because it wrongly seemed to minimise a prejudice he had “fought against all my life”. The episode ended when officials again guided him into the building to speak at the meeting, where he defended people’s rights to criticise Israel as an “apartheid state”.